Replaying Arkham Asylum now—because for obvious reasons I can’t play Arkham Knight—makes me realize that in a lot of ways it’s the best of the Batman games. Being set on one island full of mad people gives it a tight control of its scope, and only in the occasional boss fight does it feel like it’s bitten off more than it can chew. But then there’s a moment when I fall off something and have to wait for Batman to float all the way to the ground before using the Batgrapple to Batlaunch his Batself onto the platform I want him be on and I remember the most useful innovation of the sequel. Arkham Knight levels up the gliding again—at least, my friend with a PS4 says it does—by letting you travel even further with each Batlaunch. In a way the games are modeling the way Batman’s powers have changed over the years in other media. 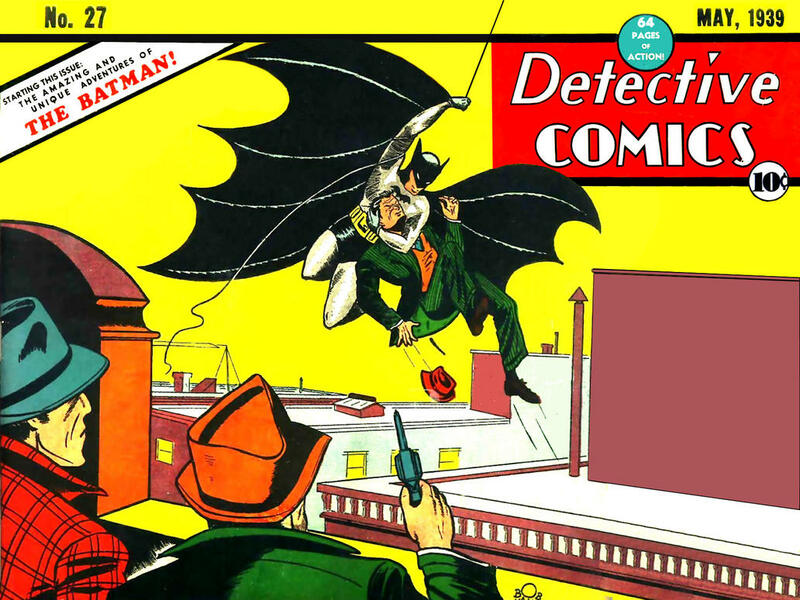 On the cover of his first appearance, Detective Comics #27 from 1939, he’s swinging from a rope like a chump. It wasn’t until 1987 and the retelling of his origin in Batman: Year One that Bruce Wayne invested in a hang-glider to get around Gotham. The 1992 movie Batman Returns decided he may as well just be able to glide around whenever he needed to, as eventually he would in the depictions that followed. He’s not the only character to follow a similar path of evolution. Wonder Woman has gone from only being able to fly by jumping in her invisible plane to having the ability to glide on air currents to straight-up unassisted hurtling through the sky. Even the iconic flying superhero, Superman himself, was first conceived as just being really good at jumping, able to “leap tall buildings in a single bound.” It’s like a natural state they all aspire to: we want our superheroes to be able to get around with ease and look cool while they do it. The Arkham series aren’t the first video games to realize a movement system that makes you feel like a boss is an important part of the superhero fantasy. While a lot of MMOs limit the speed of character movement so you can’t rush through the whole thing before the maximum amount of money’s been extracted from your wallet, City Of Heroes (and its successors, including DC Universe Online) recognized it wouldn’t feel like you were a real hero if you couldn’t earn the option to fly, run super-fast, or bounce around like a muscular superball. I created a character who specialized in acrobatics—an escaped circus bear in a bowler hat named Insane Clown Fozzie, because the other great thing about City Of Heroes was its character creator—and bounding from rooftop to rooftop at speed made me feel as much like a proper superhero as punching muggers and returning handbags did. Released just a few months after City Of Heroes, the console version of Spider-Man 2 also focused on getting movement right. Its web-slinging system, which involved aiming each web-line at an individual building rather than just holding down a button and pushing in the direction you want to go while hanging ropes from the skybox, is its most fondly remembered aspect. (Sadly the PC version didn’t have this feature, but Jamie Fristrom, who designed the console version’s travel mechanic, is bringing it to PC in a different form with a game called Energy Hook funded on Kickstarter.) While a couple of follow-up Spider-Man games tried to recreate the movement—Ultimate Spider-Man and Spider-Man: Web Of Shadows—both of them simplified and tweaked it just enough that it didn’t have the same feel. It’s not an easy thing to get right, traversal. It should be an expression of the character, like the way Arkham City’s Batman carefully gains height, finds a rooftop full of thugs and then plummets out of the sky like a terrifying brick while Catwoman gets around by arching her back and falling straight off a roof before casually flicking her whip and nimbly leaping up walls, improvising as she goes. Traversal should also be tricky enough that you feel powerful for mastering it, while not being so punishing that you can’t just jump off a rooftop and figure out your next move from there. Comics are full of panels where Our Hero whizzes across the city skyline, often while narrating. It’s a useful device for squeezing exposition or character development between the action scenes while still giving the artist something dynamic to draw. It’s also a core part of the superhero power fantasy. They’re urban characters: superheroes all have their cities to protect and they should be at home in them, able to hurtle across the rooftops while ordinary people sit in traffic jams below. Super strength would be useful but really the superpower we all want is never having to catch a bus.